Wiesner’s The Three Pigs starts off as the story you know and love - three pigs building houses out of various materials, with a wolf lurking nearby. As soon as the first pig builds his house of straw, however, the wolf huffs, and puffs, and blows the pig right out of the story! The narration continues on and the wolf “ate the pig up” except… there’s no pig. The wolf goes on to the stick house, but the first pig beats him to it. The two pigs escape while the wolf continues to huff and puff and blow the pages out of order! All three pigs are together now, folding a page of the book into a paper airplane to fly around and explore. They land in a nursery rhyme and a dragon tale, bringing characters back to their story with them. The wolf is waiting, but when he huffs and puffs at the third house, it won’t come down, and not just because there’s a dragon inside! This story is a unique spin on the classic three little pigs tale. The beginning is familiar to the reader, but the pigs quickly escape their story to explore a well-known nursery rhyme and other stories. The text changes accordingly, and the pigs bring other characters back to their own story, changing their fates in the process. As the pigs leave their own story, the characters are drawn outside of the margins. There are several nearly-blank pages that show the three pigs on a paper airplane, flying away from their story towards anything else. It’s easy to picture this happening in a child’s room as they explore the bookshelves. As the pigs step into the nursery rhyme, they change from their realistic-looking selves into pudgy, cute nursery variations. The text changes as well, from black to purple, from standard fonts to rounded, kid-friendly letters. As soon as the pigs step off the page, they return to themselves, even if that means their head looks realistic while their backs are still cartoons! The pigs transform into black and white line drawings when they visit the dragon’s tale, and the dragon turns colored and scaly when he returns with the pigs to their realm. Wiesner does a great job of showing how stories differ in illustration and text. This is a great book to take time to inspect, because there are fun elements to catch as you turn the pages. The blank pages don’t seem empty because the pigs are flying across it on their paper plane, and Wiesner is very skilled with making his drawings look 3D. The pigs are flat when they’re in stories, but as they travel around, they look like they’re outside of the book entirely, looking in with you. I love how the cover to this book is so misleading - it looks like a tame traditional story because the pigs are drawn so realistically. Then you get the story started and it’s so fun and off the wall! I found it was a hard book to read aloud, because the illustrations demand so much close attention. It’s also a little difficult to keep different voices straight with the dialogue bubbles contrasting with the narration. It’s a great solo read, though, because readers can go at their own pace. I love how the pigs adapt to the different types of stories they stumble into, and I love that Wiesner shows there are many other stories available that the pigs bypass when returning to their own. I think that really hands the story over so the reader can continue it in their own imagination. 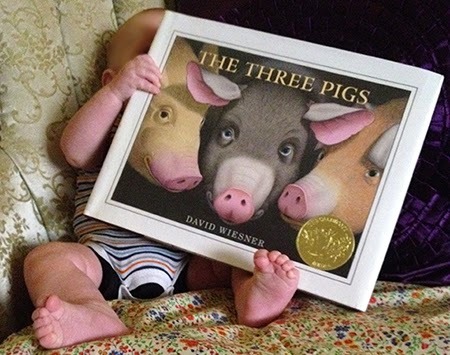 Readers can identify the other stories and nursery rhymes that serve as settings in this book, then brainstorm about where else the pigs could visit. Many fairy tales and nursery rhymes star pigs, so they’ll have a wide selection! Once they pick a different story or two, they can draw the three pigs in a a scene, in the style of the original illustrator.